Over the past twelve to eighteen months, it has been verging on one way traffic in the mobile market, with ATI delivering considerably better mobile graphics parts than those that NVIDIA were able to muster up from their somewhat lacklustre GeForce FX architecture. All of a sudden, NVIDIA were on a back foot. One thing that was clear at the recent NVIDIA Editor\'s day when CEO, Jen Hsun, spoke to us, was this: that they always produced their best work when they had their backs against the wall. I\'m inclined to agree, as I consider the GeForce 6 series to be one of their strongest product line-ups to date, while the GeForce FX series is certainly their weakest product line-up in retrospect. The discrete mobile graphics market is still in ATI’s back garden with the Canadian graphics giant holding a 69% share of discrete sales, while NVIDIA hold a mere 25% of the market, according to Mercury Research. 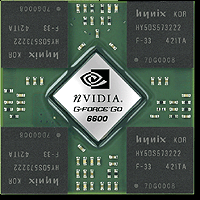 NVIDIA are working hard to address that balance, and today’s launch is another play, as NVIDIA introduce the NV43M, known as the GeForce Go 6600. We discussed the implications of Performance-Thin notebooks back in our Mobility Radeon X700 feature – notebooks that don’t require fire proof trousers to use on the move, while also having reasonable battery life. The Performance-Thin segment is basically a compromise between the compact and feature-light range of Thin and Light notebooks, and large, powerful notebooks that are known as Desktop Replacements. They usually feature massive 17” screens, the latest and greatest Athlon 64 or Pentium 4 processors, and also packing a punch in the graphics department with the GeForce Go 6800 or Mobility Radeon X800. In the past, both thermal characteristics and the power requirements of GPU’s have really limited how fast a high-end notebook can push pixels – even more so in the Performance-Thin segment, where previous models featured no more than four fragment pipelines - including the last-generation the Mobility Radeon 9700 and the GeForce FX Go 5600, which had a 2x2 fragment pipeline configuration. 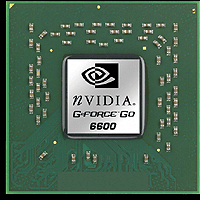 NVIDIA’s GeForce Go 6600 comes in several different clock speed configurations, which should provide ample choice for notebook manufacturers to integrate a chip of their choice, depending on how efficient the thermal design of the notebook is. Speaking of which, NVIDIA released some interesting data to us, regarding the TDP of their mobile GPU’s, which gives an interesting insight in to how far power-saving technology has come over the past twelve months in general. You can see that the GeForce Go 6600 steps forwards in to a league of its own here, more than doubling the theoretical pixel fill rate of the GeForce FX Go 5600 at the same TDP - this leads to around double the performance in real terms due to the memory bandwidth limitations that come in to place with the higher GPU clocks. You can also see where the GeForce Go 6600 and GeForce Go 6800 overlap in terms of performance - you may well find some of the higher-clocked GeForce Go 6600\'s in some of the less-elaborate Desktop Replacement notebooks. NVIDIA’s wide-range of clock speeds give a broad range of performance, but we have to ask whether there is a significant need for all of these different clock speeds. While ATI don’t list clock speed variations for their mobile parts, they do sometimes creep in; however, this is down to the notebook manufacturer’s discretion rather than ATI’s. 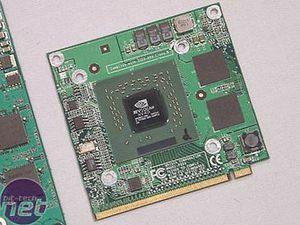 Hopefully with NVIDIA’s set three clock speed variations for the GeForce Go 6600, we should see a more modular and consistent mobile graphics market with fewer clock speed variations, which will ultimately lead towards the end-goal of being able to upgrade the video card inside your notebook with an off-the-shelf replacement. The theory is sound, but the implementation will take an awful lot of thinking. 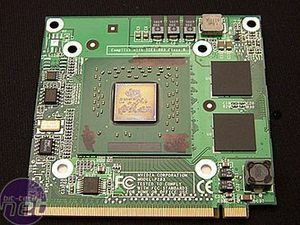 There are two chip designs for the NV43M, depending on whether the part will be integrated on to the notebooks’ mainboard, or on to an add-in card via the MXM interface; however, we expect the majority of notebook manufacturers to use NVIDIA’s MXM technology – a technology that many notebook manufacturers are welcoming, as it is finally bringing a form-factor standard to discrete notebook graphics. MXM already has over 15 different platforms in design, spread over four standardised PCBs that cover all GeForce Go 6 series graphics chips. The platform looks to be strong, and there’s finally a sense of direction in NVIDIA’s mobile line up, which could well lead to them winning back a large chunk of the mobile market from ATI – I guess that time will tell, but we can confirm that there Toshiba already have a line of products available that you can buy today, and I’ve already seen designs from manufacturers including the likes of Sony, Clevo, Uniwill and Wistron to name a few.